It is through arts and culture that we tell the stories of our community and are able to share them with the rest of the world. In Toronto, we proudly celebrate the arts and all that they contribute to our diverse community and vibrant neighbourhoods. Public art, can help shape a community’s identity and also drive economic development, place-making and city-building. The Scarborough Centre Public Art Master Plan (SCPAMP) will guide the development and/or acquisition of public art to enhance the Centre’s image and foster creativity and innovation in the shaping an authentic downtown. Building on the existing vision and policies, the Scarborough Centre Public Art Master Plan will provide strategic direction to the City on a public art program for the Scarborough Centre. The Plan will reflect the regional importance of the Scarborough Centre, the current planning policy directions and the local community. The SCPAMP will identify public art opportunities through a background policy review, site analysis, and an inventory of the existing collection. A vision and principles will be developed to guide the public art master plan through stakeholder and public engagement. have a positive influence in the community and on the City’s cultural and visual landscape. In August 2016, the City retained DTAH and Andrew Davies Public Art Consulting to undertake the study. The first Local Advisory Committee Meeting will be held on Tuesday, January 17th, 2017 and the first Community Consultation Meeting will be held on Wednesday, January 25th, 2017. 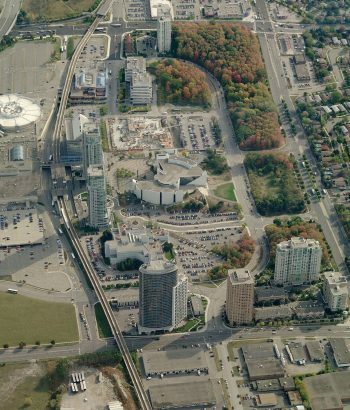 Scarborough Centre is one of four designated Centres described in Chapter Two of the Toronto Official Plan and Identified on the Urban Structure Map 2. Each of the four Centres are different in terms of its local character, its demographics, its potential to grow and its scale. The Scarborough Centre, at 180 ha (1,795,388 m2) in area, is at the core of an established employment corridor along Highway 401. As a mixed-use area, it has a significant resident (12,174 people) and employment (16,759 jobs) population; ready access to higher order transit; a focal civic presence; retail, institutional, entertainment and recreational facilities, natural heritage; and both urban and more naturalized open space. Refer to the key map below for the SCPAMP boundary area. Support for public art is articulated in a range of existing City of Toronto planning and policy documents, including the Toronto Official Plan, Scarborough Centre Secondary Plan and the Scarborough Centre Public Space and Streetscape Master Plan. The City of Toronto Official Plan sets out the basics of successful city-building. A successful city is one with a competitive advantage over others locally, nationally and internationally. It has a quality of life that will attract and retain people who have capital, skills, knowledge, ingenuity and creativity. All successful cities astonish with their human-made and natural beauty. People choose to live and businesses choose to invest in beautiful cities. Centres, including Scarborough Centre, are areas within Toronto where substantial investment in transit and other infrastructure makes it possible (and desirable) to accommodate a significant portion of Toronto’s planned growth over the next 30 years. Scarborough Centre is one of four designated Centres described in Chapter Two of the Toronto Official Plan and identified on the Urban Structure Map (Map 2). A Secondary Plan has been created for each Centre, specifically tailored to reflect the individual circumstances of each location. Building a high quality public realm featuring public squares and parks, community gardens, public art, and a comfortable environment for pedestrians and cyclists. It is also essential to attract businesses, workers, residents and shoppers. In December 2005, City Council adopted the Scarborough Centre Secondary Plan to establish a vision and strategic implementation policies for the Centre. 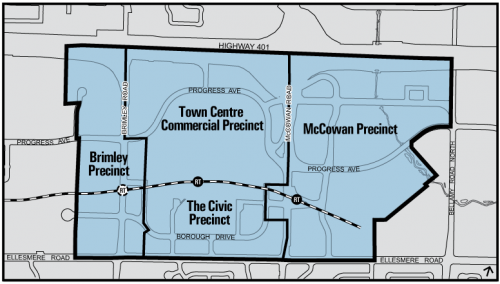 The Scarborough Centre Secondary Plan describes Scarborough Centre as an important mix of retail, government, institutional, cultural, employment and residential uses at the core of an established employment corridor along Highway 401. As the Scarborough Centre develops, high quality, urban design will play a significant role in promoting the Centre as a destination, unifying its parts and connecting it to the surrounding area. Improvements and enhancements to the green spaces, streetscapes, pedestrian and cycling paths and the provision of public art and way-finding will physically and visually unite the area and create an attractive, interesting “place” for residents, workers and visitors. To create an improved sense of place for the Scarborough Centre, development in the Centre will be guided by specific policies in Section 3 of the Secondary Plan. Section 3.1.4, Public Art, specifically encourages public art along public streets and at prominent locations on private lands. In July 2012, City Council endorsed the Scarborough Centre – Public Space and Streetscape Master Plan. Council supported the implementation of the projects and initiatives identified in the plan, in order to, over time, significantly improve the quality and character of the public spaces and streets in the Civic and Commercial Precincts of the Scarborough Centre. The purpose of the Master Plan is to reinforce the vision for the Civic and Commercial Precincts and to identify priority projects and implementation strategies to improve and enhance the public space framework. 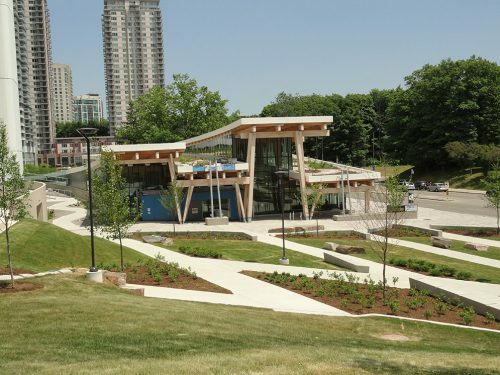 To date, two of the seven priority projects have been completed – the redesign of the Civic Green and the implementation of the Woodlot Management Plan. Consultation with representatives of various stakeholders in Scarborough Centre and the surrounding neighbourhoods. They will provide input into the Vision and Guiding Principles for the SCPAMP. There will be two stakeholder meetings, one in Phase I and one in Phase II. City staff and the consultant team will be presenting the Principles, Vision and Demonstration Plan to TPAC.